Campbell, Rod. Very Good. Dear Zoo: A Lift-The-Flap Book (Dear Zoo & Friends) by Campbell, Rod. Lift-the-flap book. Glued binding. Paper over boards. 18 p. Contains: Illustrations, color. Dear Zoo & Friends. Intended for a juvenile audience. Campbell, Rod. Good. 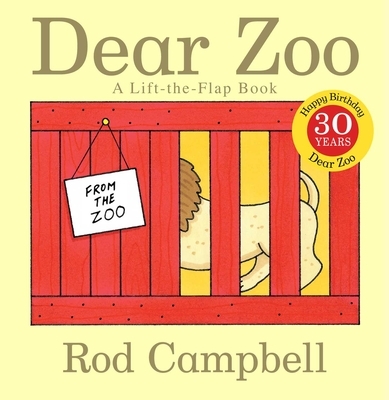 Dear Zoo: A Lift-The-Flap Book (Dear Zoo & Friends) by Campbell, Rod. Lift-the-flap book. Glued binding. Paper over boards. 18 p. Contains: Illustrations, color. Dear Zoo & Friends. Intended for a juvenile audience. My 15 month old enjoys this book - - he loves interactive books. It's not the most imaginative book and the words are just ok, but my little one has picked it out of the basket about a dozen times in the past month. My grandbabies love this book and ask for it over and over again. It helps with animal identification and sounds (provided by you). Lift-the-flap books are enticing for little fingers, too.